A living statue or human statue is a performer who poses as a statue or mannequin, usually using realistic mannequin or statue make-up. Some can pose for hours at a time, but others choose to move more frequently to engage the audience. Living statues are a popular type of busking and can be found in tourist areas in most large cities. 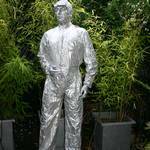 Living statues are a great addition to parties, weddings and events. Their history can be traced back to the medieval era. Living statues or tableau vivants were regularly featured in Medieval and Renaissance pageantry and festivities. A group in a scene would be mounted on an elaborate stand decorated to look like a monument; this would then be located on the route of the procession. Today there are a number of festivals that still keep the tradition of tableau vivant alive. In Laguna beach USA, The Pageant of the Masters, founded in 1932, uses local volunteers and turns them each night into works of art. Arnhem in the Netherlands holds the World Living Statues Festival. In the UK, there is a parade in bridgwater, where many of the people on the floats are frozen in tableau vivants.